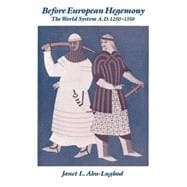 In this important study, Abu-Lughod presents a groundbreaking reinterpretation of global economic evolution, arguing that the modern world economy had its roots not in the sixteenth century, as is widely supposed, but in the thirteenth century economy--a system far different from the Europeanworld system which emerged from it. Using the city as the working unit of analysis, Before European Hegemony provides a new paradigm for understanding the evolution of world systems by tracing the rise of a system that, at its peak in the opening decades of the 14th century, involved a vast regionstretching between northwest Europe and China. Writing in a clear and lively style, Abu-Lughod explores the reasons for the eventual decay of this system and the rise of European hegemony.